I was walking along Newbury Street with my sister this Fall and as I often do, was remarking on the beautiful architecture that lines the street. We went past 130 Newbury and I mentioned that until 2010 this building was once home to the Judi Rotenberg Gallery and for over 40 years it showed contemporary artwork. In fact as an ode to the history of the building the commercial space, now occupied by Goorin Brothers Hat Shop, the gallery name is still on the trim over the first floor. As time goes pass, things change on Newbury Street, gradually for the most part. 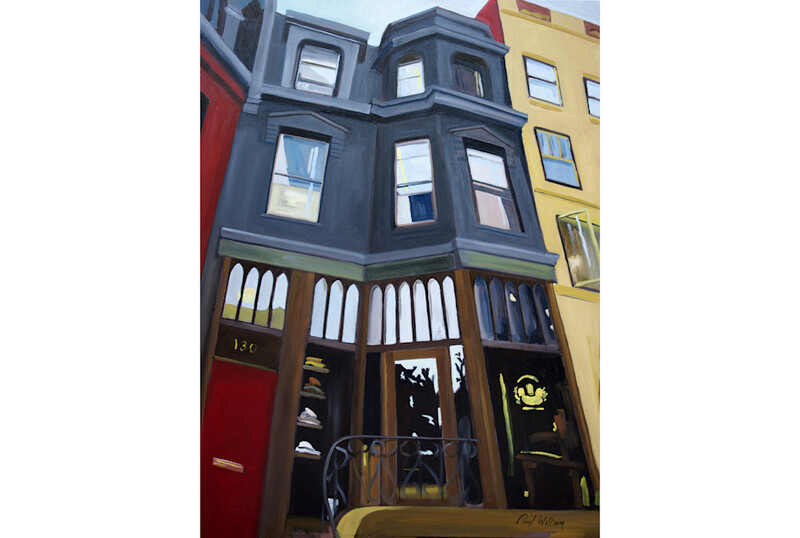 From the initial construction as residential buildings, like the neighboring streets in Back Bay, the street is now filled with boutiques and restaurants...and of course, many visually stimulating places to paint. For me, one of the fun parts of painting the architecture on the street is the constantly changing commercial spaces with the new window displays, reconfigured storefronts, and ways to engage those of us that frequently walk by. If you're up for an interesting short read on the history of the street take a look HERE.